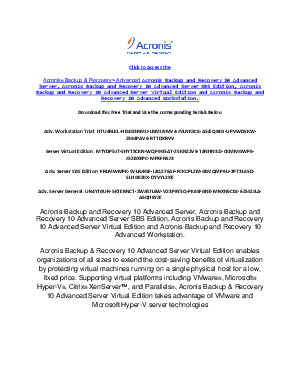 Software Download Published By: Acronis Inc.
Based on Acronis’ patented disk imaging and bare metal restore technologies, AcronisBackup & Recovery 10 Advanced Server is the next generation of the Acronis True Image disaster recovery family for physical and virtual environments. It simplifies and automates backup and restore processes across Windows and Linux environments, and remotely monitors and manages geographically distributed servers and workstations. With Acronis Backup & Recovery 10 Advanced Server, the operating system, applications and all data can be recovered in minutes, instead of hours or days. Engineered for enterprises of all sizes, Acronis Backup & Recovery 10 Advanced Server scales to thousands of machines. It provides organizations with advanced data backup and system recovery capabilities such as: data deduplication, enhanced security, operations dashboard, policy-based management, among others. Organizations can leverage Acronis Backup & Recovery 10 Advanced Server’s functional power and exceptional ease of use to simplify their backup and recovery processes while improving their ability to meet challenging Recovery Time Objectives (RTOs).